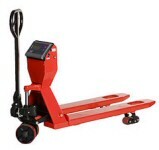 MOBILE SCALES ON HAND PALLET TRUCKS, WAREHOUSE TRUCKS AND FORKLIFT TRUCKS. MOBILE WEIGHING: SAVING TIME, SPACE AND MONEY. "With mobile scales you weigh during transport, so you save time, space and manpower. You weigh where you want, so you are flexible in your logistics. A mobile scale earns itself back within a short period of time. supply diesels, gas, electric, 3 and 4 wheel, pallet trucks, reach trucks, sideloaders, in fact anything you need. 95% of the equipment is available from stock delivered to you in either 3 days or next day.